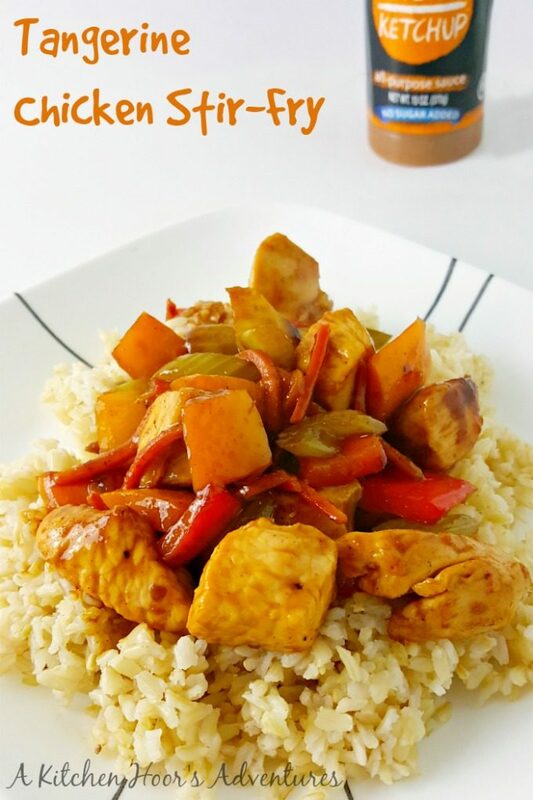 Both sweet and tangy, this #FreshTastyValentines recipe for Tangerine Chicken Stir-Fry is healthy and quick, It uses @NotKetchup Tangerine Hatch Chili sauce, lean chicken breast, and tasty vegetables for this delicious dinner. I love Not Ketchup. Every event Camilla hosts can almost guarantee each blogger a bottle of Erika’s tasty sauces. I’ve made Turkapple Burgers with Yumback Sauce and Purple People Eater Sliders with the blueberry white pepper sauce, Cherry Chipotle Chicken Barbecue Sandwiches and Lime Shrimp with Chipotle Cherry Cocktail Sauce with the cherry chipotle sauce, and Slow Cooker @NotKetchup Smoky Date Barbecue Sandwiches with the smoky date sauce. The only one I haven’t cooked with is the spiced fig sauce. Like I said, Camilla events = delicious bottles of Not Ketchup sauce; this event included. We’re heading into the home stretch of #FreshTastyValentines where 22 bloggers are putting together some amazing #FreshTastyValentines recipes for you to cook up for your loved ones this Valentine’s Day. Camilla over at Culinary Adventures with Camilla invited some amazing bloggers – myself included – and some SUPER generous sponsors for this event where we cooked up some healthier Valentine’s recipes for our loved ones. So, make sure you show her some mad love and comment on her recipes. And don’t forget to enter the giveaway in this post. Now, this tangerine hatch chili sauce from Not Ketchup is truly different from all the other sauces Erika sells. “Why?” you ask? Well, it has not sugar in it. So, for those of you that are following a low-carb, diabetic, or just a low sugar diet, this one is perfect! It’s tangy and delicious! 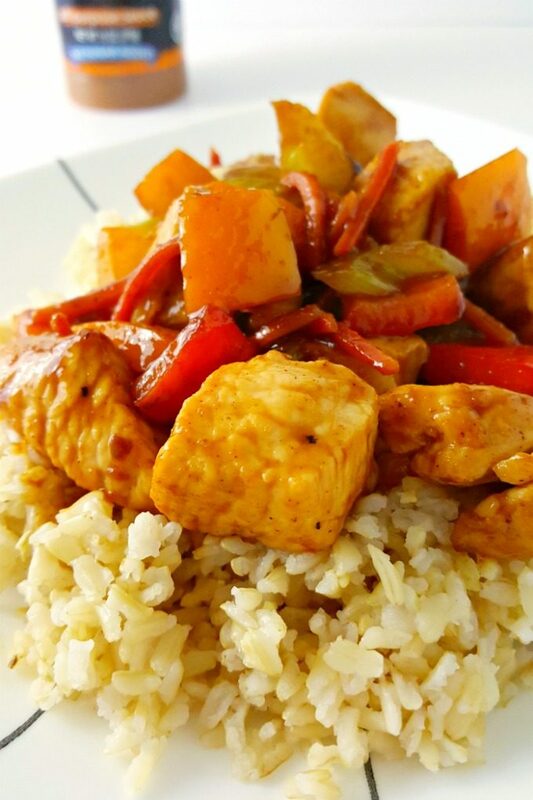 Granted I did put brown sugar with mine in this sweet and sour style stir-fry. I initially was going to make some macadamia nut crusted chicken fingers and use this as the dipping sauce. Yeah. Didn’t happen. Snowzilla happened and I didn’t make it to grocery that weekend. It truly did put a damper on my recipe creating for a good week! Anyway, this new tangerine Not Ketchup sauce has amazing tangerine flavor. Once I tasted it, I instantly thought of an orange beef recipe. This morphed into the Tangerine Chicken Stir-Fry you’re reading about today. One, because I forgot to take beef out for dinner and two – see previous paragraph. I mean, I knew what I wanted it to taste like, but didn’t do much research on how to get it to taste like that. Initially, I was only going to add a few tablespoons of the Not Ketchup, but then I looked at it and was like, “That’s just not enough sauce!” So, I added more tangerine hatch chili sauce and it was PERFECT! I tasted it before I put it on the chicken and veggies and almost wanted to drink the bowl. Now, since this is supposed to be a healthy recipe, I made sure to use lean chicken breast. I didn’t add oil to the pan; I used cooking spray. Please use oil should you chose to, but the hubs has cholesterol issues which I’ve discussed many times before. So, the little oil I use – yes even the “heart healthy” kind – the better. His cholesterol is genetic so it’s a lose lose for us eventually. I used fresh vegetables and a LOT of them! They far outweighed the chicken in this recipe. Then, when all was said and done, I put it on deliciously nutty brown basmati rice. And that was dinner last night. Literally. And we ate late because we went on a little shopping spree out at Leesburg. It’s funny because we went looking for some Nike flip flops for the hubs. We got everything BUT that! I got some fuzzy comfies from Jockey, some new boots from Rockport (Not just for old people I swear by these most comfortable heels EVER), some shoes for the hubs, and I got a grown up purse. HA! I’m so not a purse person but since I have to carry reading glasses now, I need a purse. Yup, everything BUT flip flops for the hubs. So, to say this recipe came together quickly and easily is an understatement. Once the rice was cooked, it took about 20 minutes start to finish. You could easily whip this up any night of the week for a healthy, tangy, and delicious meal for your loved ones. Now, make sure to show Erika some love for sending us a bottle of her new sauce and supporting our little group of bloggers. Head to her Not Ketchup site and be sure to follow her on Facebook, Pinterest, Twitter, Instagram, and Google+. Combine the first five ingredients (Not Ketchup through sesame oil) in a small mixing bowl. Set aside. Place a large skillet coated with cooking spray on the burner. Add the garlic and ginger and heat the pan on high heat. When the garlic beings sizzle add the vegetables. Stir fry 1 to 2 minutes before adding the chicken. Sautee the chicken until almost cooked through. Pour the ketchup sauce over the chicken and reduce heat to simmer. Continue to simmer until the chicken is cooked through and the sauce thickens slightly. Remove from heat and serve with brown rice and egg rolls. Yum. I know what I will be making with the rest of my bottle of Not Ketchup! It was yum! Hope you like it!